Side-by-side battles for the win, flaming engines, five-wide battles for position, a roll-over, sparks, hits, charges . . . the Fifth Annual Fall Festival was a great way to wrap up the 2013 season at MISSISSIPPI THUNDER SPEEDWAY . . .
MISSISSIPPI THUNDER SPEEDWAY is happy to announce plans for the upcoming 5th Annual Fall Festival, October 4th and 5th! In addition to all regular weekly divisions, MTS will also be running regionally sanctioned Midwest Modifieds; and since USRA National Points are still being awarded, racers will be battling hard at this show! Many of the USRA Points chasers may be present. We will also be allowing Pure stocks from Chateau, Eagle Valley, as well as USRA Hobby Stocks to all run together for a larger purse. Should be interesting to see how they compete together. 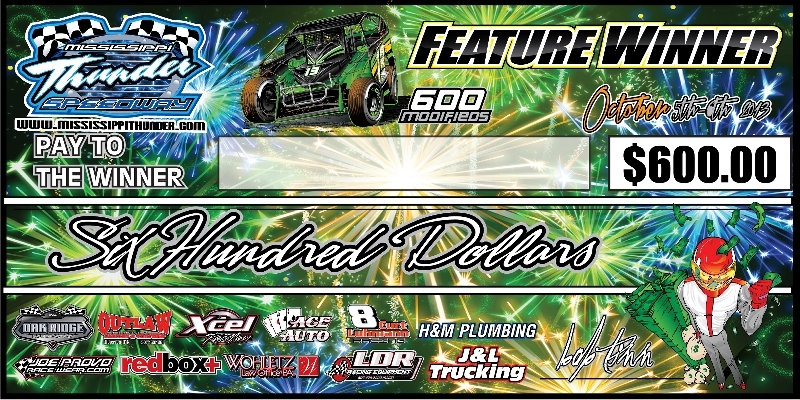 All total, over $2200.00 additional purse money up for grabs in the 600 mod class! A possible $500 to win Friday and $600 to win Saturday! The IMCA Sport Mod, the WISSOTA Midwest Mod, the USRA B-Mod, whatever you call it, it's the dirt track equivalent of "the third wheel" on a high-school date. For years the division has been looked upon as either a starting place for up and coming drivers, or the resting place for under-funded race teams. It's a support division that's used to 'fill out the card' at any number of race tracks special events or even weekly programs. It took MISSISSIPPI THUNDER SPEEDWAY owner Bob Timm, and division supporter Jack Baehman to shine the spot light on the class, bust the shackles off its competitors and introduce it to the crowd as a headline event. 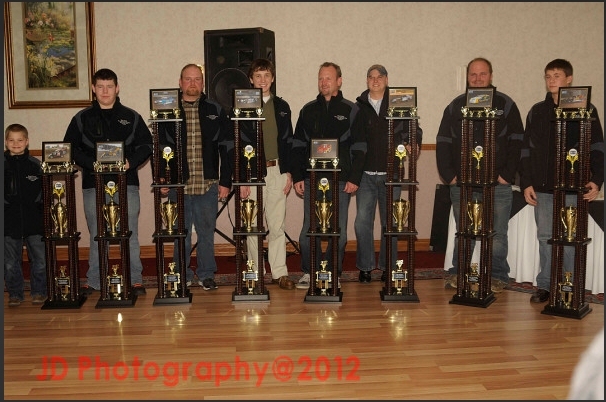 In 2012, the First Annual Baehman Law B-Mod Nationals had racers doing double-takes, asking "really?" and trying to shake the disbelief from their minds; it went on to bring drivers from 14 states to the high-speed 1/3 mile just north of little Fountain City, WI and packed the grandstands with people who wanted to see the 'Everyman' finally get a chance to compete for the big paycheck. For racers who normally compete for anywhere from $300 to $500 for a feature win . 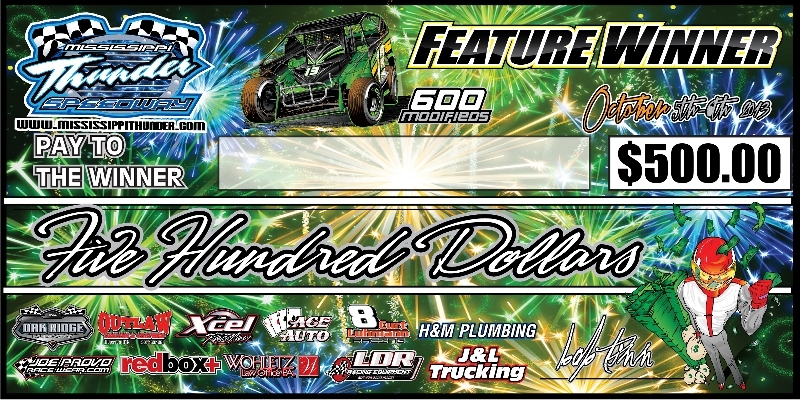 . . the announcement that the B-Mod Nationals winner would take home a check for $10,000 sounded like a lottery junkies dream come true! 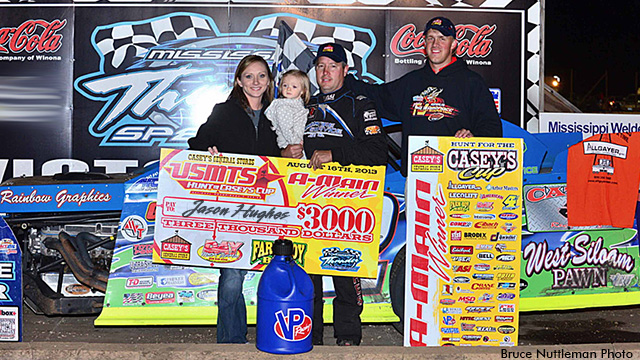 The success of the inaugural edition of the B-Mod Nationals at MISSISSIPPI THUNDER SPEEDWAY cemented the fact that there would be, at least, a second; and so, 2013 brought about the 2nd Annual $10,000-to-win Baehman B-Mod Nationals! Again, drivers and fans came from all over the United States knowing that before the first green flag flew . . . every driver had the exact same opportunity . . . the opportunity to race their way to a $10,000 pay day. But, it wouldn't be easy. Two nights of preliminary racing, and then a third evening of Last Chance Qualifiers would be needed to fill out the 30 car field which would line up and take the green flag three-wide at the start of the 60-lap Main evening Saturday night September 7th . . .
Winona Daily News Sports Writer Jeff Brown (jef.brown@lee.net) writes: Big-time money draws big-time racers. And, if you’re Bob Timm, you’re banking on that hefty purse bringing in some rather big-time crowds. Timm, who has quickly built Mississippi Thunder Speedway, a one-third mile high-banked oval, into one of the region’s must-be places, has a three-day B Modified show that will rival any in the country. 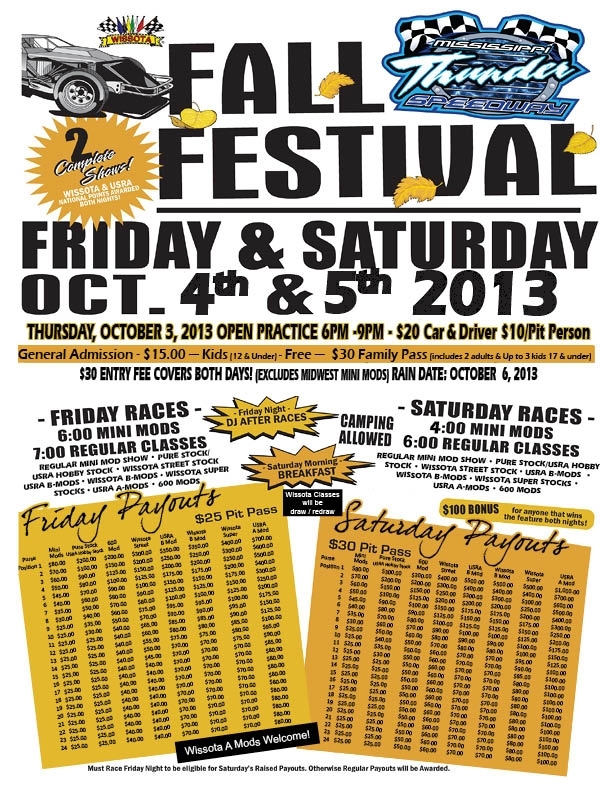 It starts tonight at the track, which is located just outside Fountain City, and runs through Saturday . . .
Driver's wrapped up the regular season points battles of the 2013 season at MISSISSIPPI THUNDER SPEEDWAY Friday night by pushing it all the way to the final checkered flags of weekly points paying action! And in six of the eight weekly divisions, Track Championships were wrapped up in style with feature wins . . .
Loberg Auto Glass & Repair night produced several First-Time feature winners while also welcoming several racers back to the MISSISSIPPI THUNDER SPEEDWAY Victory Lane . . .
Bring the family and friends and enjoy Loberg's Auto Glass & Repair $20 Car-Load Night - $20 per car at the gate, regardless of how many race fans you SAFELY pack into the automobile! Admission to this Fridays racs will be charged by the car load. Thats right, load up any passenger vehicle and everyone in the car will get in for just $20.00. Got 7 people in your mini van.... thats just $2.85 each to get in! This does not include buses, rv's, ect., only passenger vehicles. Regular show pricing will apply for those not chooing to pay by the car load. Bring the kids as well, the first 40 kids through the gate get a FREE TATOO (temporary, of course)! The Jailhouse Saloon WISSOTA Street Stock drivers will also be featured in the evening's autograph session in the Hospitality area during intermission! So, come out and enjoy all the family-friendly affordable fun with on-track action, (including the WISSOTA ROC Qualifiers) from the River City Manufacturing USRA Modifieds, Coordinated Business Systems WISSOTA Super Stocks, Black Horse Bar & Grill USRA B-Mods, Jailhouse Saloon WISSOTA Street Stocks, Redbox+ 600 Modifieds, & Elmer's Auto Salvage MTS Pure Stocks battling on 'The Big 1/3-Mile' (Opening Ceremonies at 7 PM) while the Sunshine Sanitation A and B Mini-Mods will again attack 'The Lightning Speedway' (at 6 PM) for their evening's action . . .
Jason Hughes emerged with the victory Friday night after a thrilling 40-lap main event at the Mississippi Thunder Speedway for Round 7 of the Hunt for the USMTS Casey's Cup . . .
COCA-COLA BOTTLING COMPANY OF WINONA BRINGS USMTS HUNT RACE TO MISSISSIPPI THUNDER SPEEDWAY! United States Modified Touring Series drivers are locked and loaded as The Coca-Cola Bottling Company of Winona prepares to bring the Hunt for the USMTS Casey’s Cup back to MISSISSIPPI THUNDER SPEEDWAY! The Friday August 16th event will pay a minimum of $3,000 to win with the top prize ballooning to $5,000 for any drivers taking part in the Big Dog Buy-In. The USMTS action will be joined by Black Horse Bar & Grill USRA B-Mods, Jailhouse Saloon WISSOTA Street Stocks and redbox+ 600 Mods with the first green flag scheduled for 7:00. Make sure to get to the track early to watch the Sunshine Sanitation Midwest Mini Mods and Outlaw Mini Mods at 6:00 on The Lightning Speedway. A family pass pack is just $40 and gets in two adults and up to three children. Adult general admission is $18, seniors get in for $16, students ages 13-18 are $9 and children ages 12 and under get in for free . . .
ANGST, SANDERS, BLEESS, WOJCIK ENJOY SUGAR LOAF FORD NIGHT FEATURE WINS AT MISSISSIPPI THUNDER SPEEDWAY! 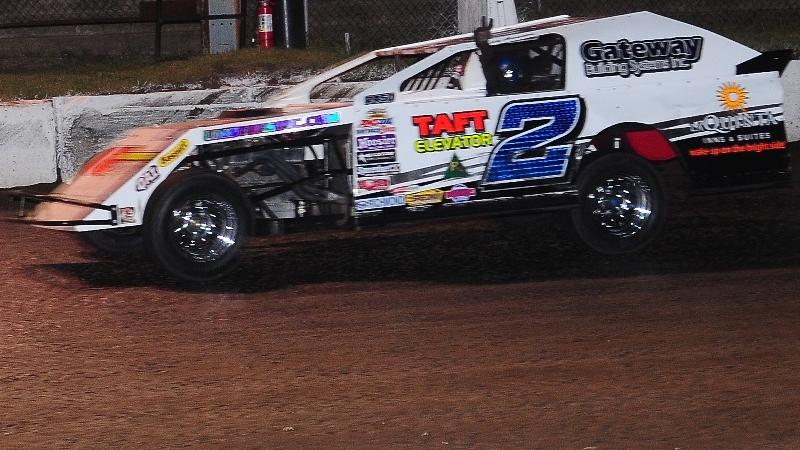 As the 2013 racing season cruises deeper into the final complete month of on-track competition at MISSISSIPPI THUNDER SPEEDWAY, some points battles are heating up, while others are being decided. Doug Wojcik is one driver who's trying to complete the 2013 season, and the related points battle, with an exclamation point. The Ladysmith, WI driver picked up his sixth straight Jailhouse Saloon WISSOTA Street Stock Feature win and 8th of the season . . .
SAVE $2 OFF ADMISSION DURING SUGAR LOAF FORD NIGHT AT MISSISSIPPI THUNDER SPEEDWAY! Sugar Loaf Ford night is this Friday August 9th at MISSISSIPPI THUNDER SPEEDWAY! As part of their special evening, they want to help you save some money at the admission gate; just present any Sugar Loaf Ford receipt and you'll save $2 off admission. Detail Receipt, Parts Receipt, Service Receipt, New or Used Car purchase Receipt - ANY RECEIPT from Sugar Loaf Ford can be used to save $2 off price of a general admission ticket to MISSISSIPPI THUNDER SPEEDWAY this Friday night, August 9th at MISSISSIPPI THUNDER SPEEDWAY! FINAL MONTH OF REGULAR SEASON ACTION UNDERWAY AT MISSISSIPPI THUNDER SPEEDWAY! With August breaking the day before, MISSISSIPPI THUNDER SPEEDWAY racers and fans entered the final month of regular season action at the fast 1/3-Mile oval. Kwik Trip invited any and all to turn out for the second 'Fan Appreciation' night of 2013, and turn out they did - a full grand stands greeted those racers who prepared to attack the track and their competition. The River City Manufacturing USRA Modified feature began with a familiar name in an unfamiliar place, Winonan Brian Albrecht has been behind the wheel of a stock car for many years . . . but it had been a while since race fans were able to enjoy seeing his familiar #6T7 out front. Not only did Albrecht enjoy some time out front, for the first ten laps he held off none other than Brad Waits and every challenge he could offer with his black NFG #24 . . .
$5 ADMISSION AS KWIK TRIP PRESENTS THE SECOND FAN APPRECIATION NIGHT AT MISSISSIPPI THUNDER SPEEDWAY! This Friday night August 2nd, Kwik Trip presents the second 'Fan Appreciation' night of the 2013 season to help pack the grandstands with $5 admission for ALL spectators and children 12 and under will still be admitted absolutely free! In addition to the Family-Friendly admission prices, we'll be amping up the fun for the youngsters in the crowd with a Balloon artist in the hospitality area performing for the kids for 2 hours - and if that's not enough, we'll also have an autograph session with the Coordinated Business Systems WISSOTA Super Stock drivers during intermission! So pack your family, friends and neighbors into the 'family truckster' and head on over to MISSISSIPPI THUNDER SPEEDWAY this Friday night, August 2nd, for 'Fan Appreciation night' presented by Kwik Trip. CORY CRAPSER WINS BAEHMAN LAW B-MOD CHALLENGE AT MISSISSIPPI THUNDER SPEEDWAY! Everyone in the racing community knows the importance of support. Drivers have, want or need sponsors - but tracks have the exact same haves, wants and/or needs. Thankfully enough, MISSISSIPPI THUNDER SPEEDWAY has just such supporters; one of which is Baehman Law - the title sponsor of Friday's 5th Annual Baehman Law B-Mod Challenge, a $1000 to win special event topped only by the Baehman Law B-Mod Nationals, the much talked about $10,000 to win special scheduled for September! "Special thanks to Jack and Stacy Baehman for a successful 5th Annual Baehman Law B-Mod Challenge race!" said MISSISSIPPI THUNDER SPEEDWAY owner Bob Timm, after Friday's program, "Nobody has done more for B-Mod drivers racing at MISSISSIPPI THUNDER SPEEDWAY over the last 5 years than Jack Baehman! It would not be possible to do these special events without the support of sponsors; and ones willing to donate as much as Jack are few and far between!" Thirty USRA B-Mod racers showed up for their crack at the $1000-to-win, $100-to-start, payout for the 25 lap main event. After four heat races, and a last chance qualifier B-Main, the starting field of 26 was ready to attack the track, and each other for the race to the checkered flag . . . THIS FRIDAY NIGHT - THE 5TH ANNUAL BAEHMAN LAW B-MOD CHALLENGE AT MISSISSIPPI THUNDER SPEEDWAY! MISSISSIPPI THUNDER SPEEDWAY is excited to once again present the Baehman Law B-Mod Challenge! 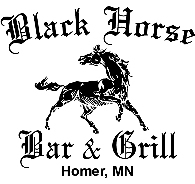 Friday July 19th, the Black Horse Bar & Grill USRA B-Mod racers will be battling for a $1000-to-win payday! For the fifth year in a row, Baehman Law is ready to celebrate the USRA B-Mod division by hosting the $1000 to win Baehman Law B-Mod Challenge at MISSISSIPPI THUNDER SPEEDWAY. Joining in the excitement will be all regular divisions: River City Manufacturing USRA Modifieds, Coordinated Business Systems WISSOTA Super Stocks, redbox+ 600 Mods, Jailhouse Saloon WISSOTA Street Stocks, & Elmer's Auto Salvage MTS Pure Stocks hitting the wide and sweeping corners of 'The Big 1/3-Mile'; while the Sunshine Sanitation A & B Mini-Mods are joined by The Outlaw Mini-Mods on THE LIGHTNING SPEEDWAY! And, of course, the fans will get in on the fun as well - All Black Horse Bar & Grill USRA B-Mod racers will be involved in an autograph session in the 'hospitality area' during intermission, there will be tons of kids prizes - including two (2) free bikes, T-Shirts, hats, and more! There will be the fan-favorite 'Feature Event Frisbee Fling' for all B-Mod racers who make the evening's feature and the fan holding the winning driver's Frisbee will win $100.00 cash! And despite a special of this magnitude, admissions prices are no different than every regular weekly event! RETURN VISITS TO VICTORY LANE THE THEME DURING JOE SIGNS NIGHT AT MISSISSIPPI THUNDER SPEEDWAY! Every race night ends up having a theme which seems to permeate the evening, a theme which can quickly sum up the action of the evening; the main theme throughout Joe Signs Night at MISSISSIPPI THUNDER SPEEDWAY was return trips to Victory Lane for Josh Angst, Jeff Brauer, Jacob Bleess, Doug Wojcik, Joe Provinzino, & Bobby Fort, Jr. . . . FEATURE WINNERS, CRUMPLED HOPES, A PACKED HOUSE, AND FAN FUN AT MISSISSIPPI THUNDER SPEEDWAY'S FIFTH ANNUAL RIVER CITY RUMBLE! For the fifth year in a row, River City Manufacturing and R & R Machining owners Steve and Kevin Reutzel joined MISSISSIPPI THUNDER SPEEDWAY to roll out the red carpet for both racers and fans alike by presenting the Fifth Annual River City Rumble! Drivers started submitting pre-registration slips several weeks before the July 5th event and by the time race night rolled around close to 70 modified drivers were ready to hit the track to battle for their share of the increased payout for the night's feature finishers! 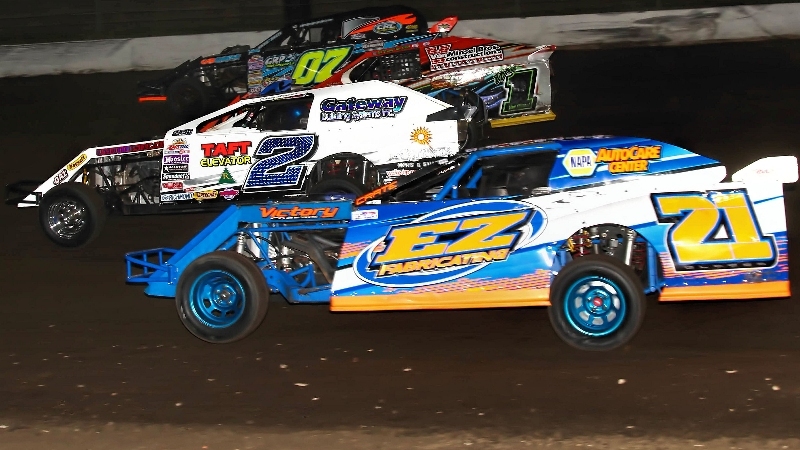 The River City Manufacturing USRA Modified division wowed the crowd with fast laps, close competition and nearly 30 of the best A-Mod racers the class has to offer. When the evening's River City Manufacturing 35-lap Main event hit the track there were no fewer than 17 National Championships, 3 MISSISSIPPI THUNDER SPEEDWAY Track Championships, and an almost uncountable number of other Track Championships represented on the super-fast 1/3 mile. The 26-car USRA Modified field took the green flag for the race to the $3000 pay check being awarded to the feature winner . . .
MISSISSIPPI THUNDER SPEEDWAY IS GETTING READY TO RUMBLE! 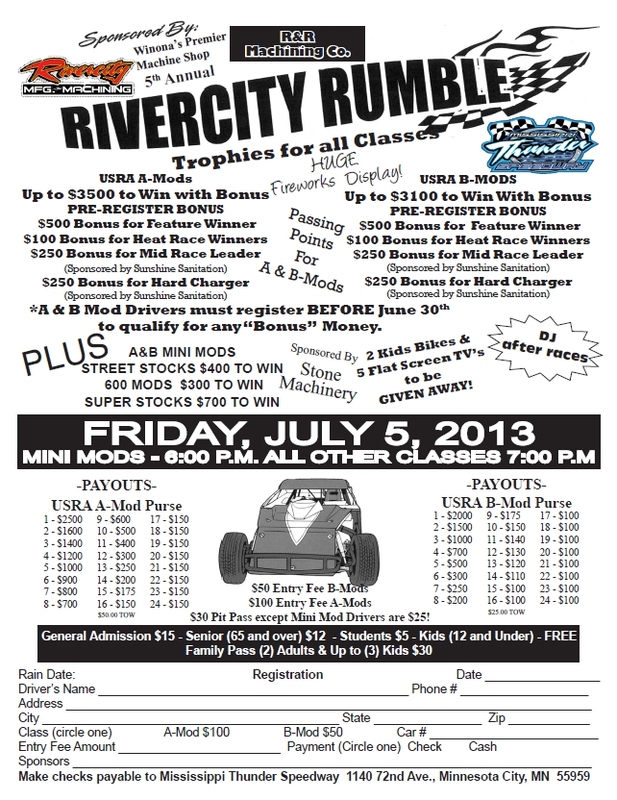 The Fifth Annual River City Rumble is coming to MISSISSIPPI THUNDER SPEEDWAY Friday July 5th. Keep your eyes on this web site for details as to who's pre-registered and what fun and exciting events and prizes are coming up . . .
$3000 to win for the River City Manufacturing USRA A Mods and $2500 to win for the Black Horse Bar & Grill USRA B Mods. Also huge fireworks display! We are also giving away (5) flat screen tv's, (2) kids bikes, (15) $20 gift certificates to The Black Horse Bar & Grill, and more than (50) kids prizes like remote controlled trucks, (2) Razor Scooters, bubble guns, bead kits, nerf footballs, frisbees, hoolahoops, etc. Kids 12 and under get in free AND the first 100 kids through the gate get a free American flag to help celebrate the extended Fourth of July weekend! A & B mod drivers will throw Frisbees into the crowd and the spectator holding the winning car Frisbee for both A & B mod will be given $200 cash! Drivers from more than 8 different states are already pre-registered! 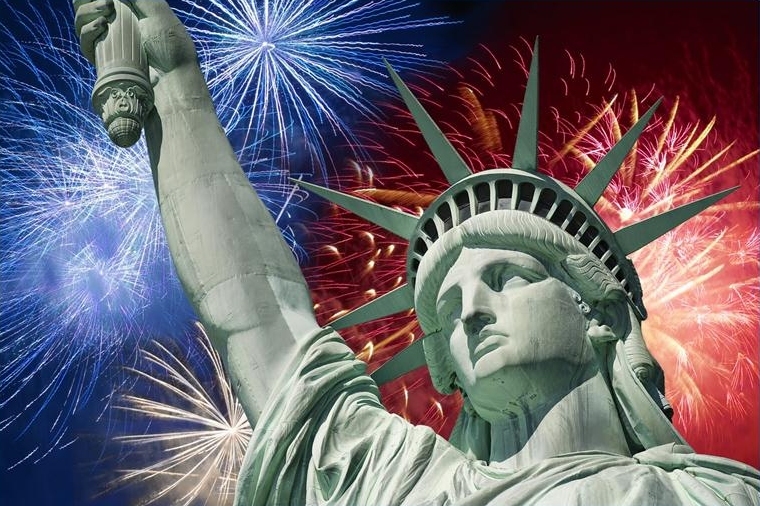 Below is a listing of Drivers who have already pre-registered as of Thursday Morning July 4th. RODEWALD, TIMM, WAITS, WOJCIK VISIT VICTORY LANE AT MISSISSIPPI THUNDER SPEEDWAY! Race fans flocked to MISSISSIPPI THUNDER SPEEDWAY in Fountain City, WI Friday night to enjoy the fun and pageantry which is Winona Radio / Budweiser Night - as an event which originally started back in the late '80s, it's one of the longest running, if not THE longest running, racing event promotions in the area, and fans know the fun factor will be high. This year, despite a late afternoon shower, the fun for the fans in the packed grandstands was indeed high; matched, perhaps, only by the on-track excitement which unfolded before them on the super-fast 1/3 mile. Much of the talk at the end of the evening concerned the start of the Black Horse Bar & Grill USRA B-Mod Feature. As the pack came roaring out of turn four on the opening lap, the field drifted high on front straight. Driver opinions varied as to where the action actually began, but the #4G of Trempealeau, WI racer Chris Gilbertson, starting on the outside of the third row, was forced into the front straight concrete wall just before the starter's flag stand at the start finish line . . .
WINONA RADIO - BUD NIGHT READY TO PACK THE GRAND STANDS AT MISSISSIPPI THUNDER SPEEDWAY! Friday night June 28th, one of the longest continuously running local racing promotions will once again hit the track in Fountain City, WI; "Winona Radio - Bud Night", a yearly racing event since the late 1980s, will once again welcome race fans to MISSISSIPPI THUNDER SPEEDWAY with prizes and fun! In addition to the prizes, 'Fan Appreciation' night plans to pack the grandstands with $5 admission for ALL spectators, and children 12 and under admitted absolutely free . . .
LATE RACE PASSES FOR THE WIN THE NAME OF THE GAME AT MISSISSIPPI THUNDER SPEEDWAY! Every fan of racing loves to watch a great battle for position; when that battle for position is for the lead, even better. When the battle for lead is in the closing laps of feature . . . look out, 'cause the fans will be on their feet, the enthusiasm will be high and the drivers will be pushing just as hard as possible. 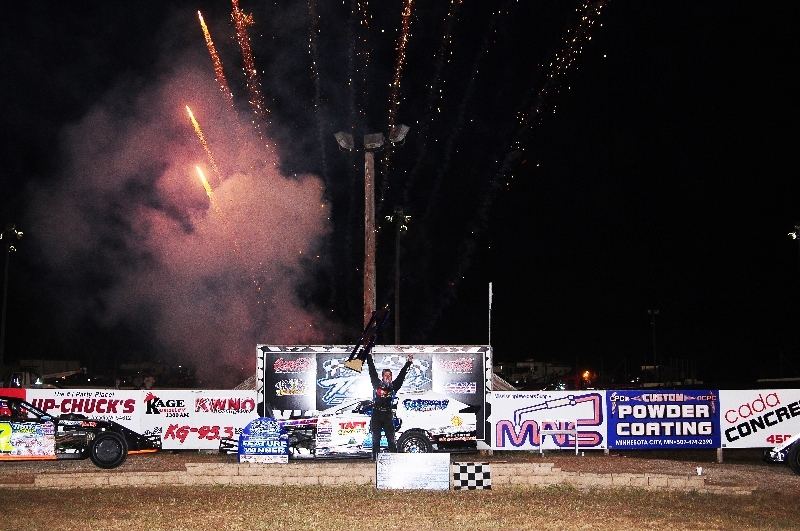 Friday night's action at MISSISSIPPI THUNDER SPEEDWAY was a race fans dream, as every single feature event of the evening came right down to the final lap to determine who was going to be pulling into Victory Lane . . .
JUNE 14th IS ‘LA CROSSE & MONROE COUNTY RESIDENCE FREE ADMISSION NIGHT’ AT MISSISSIPPI THUNDER SPEEDWAY! On the heels of a very successful Fastenal Night June 7th, MISSISSIPPI THUNDER SPEEDWAY is excited to announce that the focus on the fans continues this Friday June 14th with "Winona County Night at the West-Central Wisconsin dirt track! Employees of Winona County will be enjoying the evening's action from the V.I.P. Suites while fans from La Crosse and Monroe Counties (Wisconsin) will be enjoying the evening's action absolutely free of charge! That's correct, race fans who show up at the main ticket booth showing an official document to prove residency in either La Crosse of Monroe counties (Wisconsin) will be escorted into the main grandstands to enjoy the night's races with free admission . . .
HOULE, KISLING, MOUDRY, & HANSON ARE VICTORY LANE VISITORS ON FASTENAL NIGHT AT MISSISSIPPI THUNDER SPEEDWAY! The racing community in West-Central Wisconsin are probably Fastenal would be weekly event sponsors at MISSISSIPPI THUNDER SPEEDWAY. Throughout this hit and miss start to the 20113 racing season, it seems that Mother Nature had gotten into an 'every other week' schedule of allowing on-track action at the fast 1/3-mile oval in Fountain City, WI. But this Friday night, Fastenal put together the whole package to bring to MISSISSIPPI THUNDER SPEEDWAY, a packed grand stands of fans, a near uncountable number of prizes, the Carl Edwards #99 Fastenal sponsored Roush Fenway Racing's 2013 Sprint Cup car, and, yes, blue skies and sunshine! And even after that sun had set, you could say that the sun was still shining on Ham Lake, MN's Jeremy Houle . . .
JUNE 7th IS ‘FASTENAL NIGHT’ AT MISSISSIPPI THUNDER SPEEDWAY! MISSISSIPPI THUNDER SPEEDWAY is excited to announce the extravagant plans for Fastenal Night - Friday June 7th at the West-Central Wisconsin dirt track! First off is the fact that Carl Edwards' 2013 NASCAR Sprint Cup #99 Fastenal Ford Fusion will be on display at the track throughout the evening! MISSISSIPPI THUNDER SPEEDWAY owners Bob & Paula Timm and Tom & Tina Lockner are thrilled about Fastenal's involvement with the weekly event at MTS. "For the second year in a row, we're really excited to have Fastenal along for the ride," said Timm, "With Fastenal's involvement, we'll have a night full of prizes, fun in the stands, on-track action, and also the ability to present the #99 Fastenal Ford Fusion to the crowd. We know that all of this combined will be a real treat for our race fans." This Friday night, June 7th, race fans can get "up close and personal" with an actual Roush Fenway Racing 2013 NASCAR Sprint Cup #99 Fastenal Ford Fusion . . . 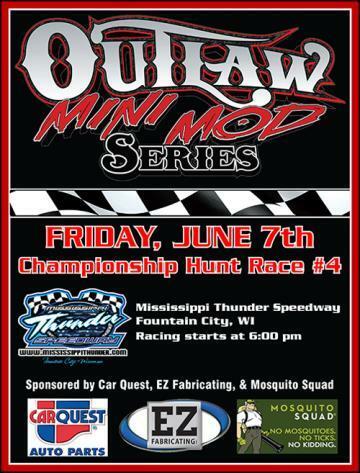 OUTLAW MINI MODS RETURN TO MISSISSIPPI THUNDER SPEEDWAY DURING JUNE 7th ‘FASTENAL NIGHT’! 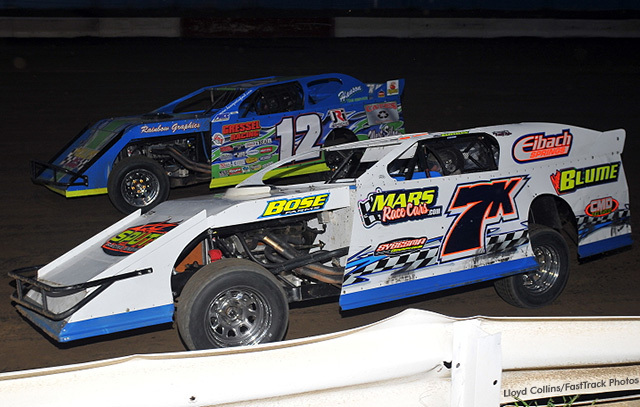 High-speeds and wide-open outlaw machinery will return to MISSISSIPPI THUNDER SPEEDWAY this Friday June 7th, as part of 'Fastenal Night' at the West-Central Wisconsin speedway. 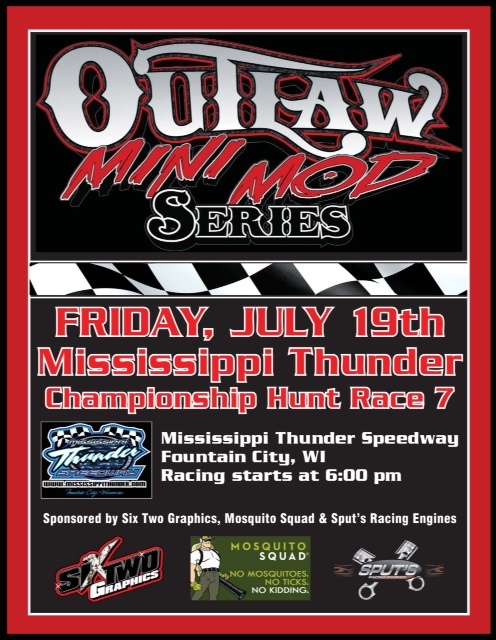 Turning laps on the MTS "LIGHTNING SPEEDWAY", the Outlaw Mini Mods are sure to be a fan-favorite! WILD NIGHT AT WEEK THREE MISSISSIPPI THUNDER SPEEDWAY ACTION! Jason Forehand and Dan Bork paced the Winona Auto Sales WISSOTA Superstocks to the starting line with $700 dollars in bonus money on the line . . . DEFENDING TRACK CHAMPIONS AND FIRST TIME VISITORS TO MISSISSIPPI THUNDER SPEEDWAY'S VICTORY LANE! Just one week ago, the buzz rippling through the racing community was how the racing weekend had been snowed out! This week, however, the weather cooperated and track crew at MISSISSIPPI THUNDER SPEEDWAY whipped the banked 1/3-Mile dark clay oval into a fast and smooth jewel that had racers flirting with early season track record lap times. The fact that the previous week's on-track action had been snowed out was, indeed, a big deal as 2013 is the second season for a 'progression bonus' guarantee. So WISSOTA Super Stock drivers were racing for an opportunity to cash in on a portion of the combined $700 worth of bonus money ($400 for the winner, $200 for second & $100 for third) at the end of Friday night's Coordinated Business Systems WISSOTA Super Stock feature . . .
MISSISSIPPI THUNDER SPEEDWAY WELCOMES TRI STAR ENGINES AND TRANSMISSIONS AS NEW SPEEDWAY SPONSOR! MISSISSIPPI THUNDER SPEEDWAY is proud to welcome Tri Star Engines and Transmissions on board as a M.T.S. Event Sponsor for the 2013 season! Tri Star Engines and Transmissions, located in Baldwin, WI, is jumping on board as the Title Sponsor of the May 3rd USMTS program at MISSISSIPPI THUNDER SPEEDWAY. To make the event promotion special, Tri Star Engines and Transmissions has taken a unique approach to their support agreement . . . not only will they be involved in the May 3rd USMTS program, not only will they be on-board as a 2013 MISSISSIPPI THUNDER SPEEDWAY Sponsor, but they've also decided to get the fans involved. On Friday night May 3rd, during the USMTS Special, they will be donating a complete "Brand NEW Tri Star 350 cu.in. Crate Engine" to the evening's 50/50 drawing . . .
MISSISSIPPI THUNDER SPEEDWAY SPONSORS STEP UP IN A BIG WAY WITH PURSE ENHANCEMENTS FOR USRA B-MODS AND WISSOTA SUPER STOCKS! MISSISSIPPI THUNDER SPEEDWAY is ready, once again, to show the racers the money!! Jack Baehman, of Baehman Law, a longtime supporter of MISSISSIPPI THUNDER SPEEDWAY and the (newly sponsored) Black Horse Bar & Grill USRA B-Mod division, is once again stepping up to the pay window for the 2013 racing season with a significant contribution to the weekly USRA B-Mod purse payout. Additionally, Jack will sponsor the Baehman Law B-Mod Challenge (July 19th) - the FIFTH annual running of the event - paying a minimum of $1000.00 to the winner. And Jack has already agreed to return as the title sponsor of the 2nd Annual Baehman Law B Mod Nationals (September 4th-7th) which pays a record setting $10,000.00 to the event winner! Super Stock drivers also have purse enhancements to look forward to in 2013. Jay Oricchio, Coordinated Business Systems and J-Mev Motor Sports will once again be contributing $200.00 a week in 2013 to the Feature winner of the WISSOTA Super Stock division! And for 2013, Jeff Brauer (Brauer Roofing Inc.). Brauer Roofing will be adding $100.00 to the 2nd place finisher's take home pay and another $50.00 to the 3rd place finisher's winnings! All three of these bonuses following the 'roll-over' scenario with the money rolling over and doubling the next week in the event of a rainout . . .
Iron Man Challenge for USRA B-Mods joins USMTS Modifieds at Mississippi Thunder Speedway May 3! The Iron Man Challenge featuring USRA B-Mods will be part of the program when the USMTS Modifieds visit MISSISSIPPI THUNDER SPEEDWAY on Friday, May 3. MISSISSIPPI THUNDER SPEEDWAY BEGINS PLANNING FOR 2013 'FIFTH ANNIVERSARY SEASON'! MISSISSIPPI THUNDER SPEEDWAY is already excitedly looking forward to the up-coming 2013 'FIFTH ANNIVERSARY SEASON' at the West-Central Wisconsin Dirt Track. In taking initial steps for the up-coming season, Speedway owners are beginning to establish and release a tentative schedule for the up coming racing season . . .
APRIL 23rd UPDATE: Added Coordinated Business Systems WISSOTA Super Stocks to May 3rd Event. APRIL 3rd UPDATE: Practice rescheduled for Wednesday April 24th with a 'rain date' of Thursday April 25th. MISSISSIPPI THUNDER SPEEDWAY 2013 CAR SHOW AND SWAP MEET RESCHEDULED FOR SATURDAY APRIL 20th! 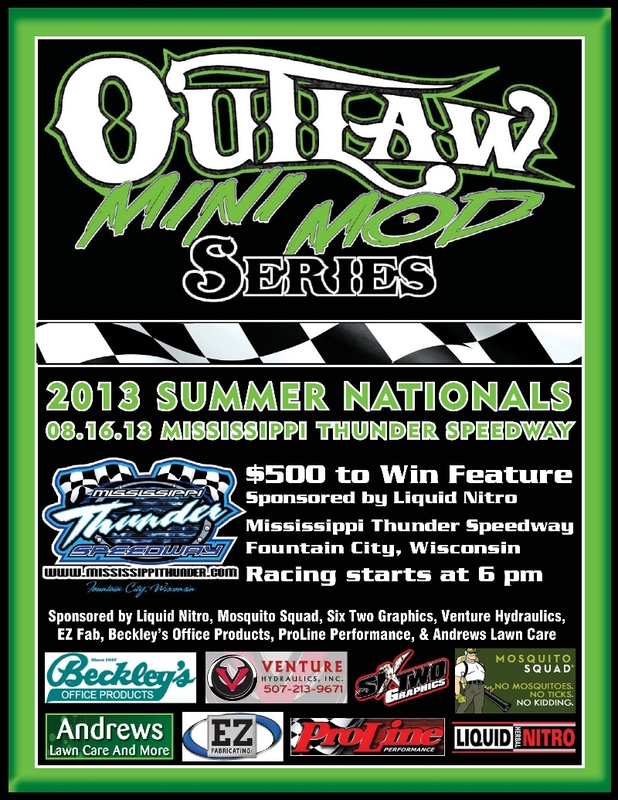 Race fans will have to wait just a little bit longer to finally see all the new hardware for the 2013 racing season as MISSISSIPPI THUNDER SPEEDWAY has decided to reschedule the 2013 car show for Saturday April 20th. MISSISSIPPI THUNDER SPEEDWAY Owner Bob Timm explained, "to be honest, it is just soo cold yet . . . I think we'll kind of loose the racing feeling if we're all standing around in snow suits". While joking a bit about the cold weather that still has the area in its grips, Timm continued a bit more seriously, "I do feel, though, that if I wait until it warms up a bit we will get more people stopping in. And with the new date being only a single weekend before our scheduled season opener, I think we can build a bunch of hype and excitement at this year's car show and carry that fan involvement right through the following week and into our season opener on the 26th. . . .
MISSISSIPPI THUNDER SPEEDWAY is happy to announce the official release of the 2013 rules package for "The Elmer's Auto Salvage M.T.S. Pure Stock" division. "We have had several rule changes in mind for 2013", said MISSISSIPPI THUNDER SPEEDWAY owner Bob Timm, "Our goals with the latest updates were to maintain affordability while addressing those issues our drivers had brought up during our innagural season of Pure Stock racing in 2012 . . .
MARCH 20th UPDATE: NO POWERGLIDES. MARCH 27th UPDATE: Stock Power Glides will be allowed. (weight penalty for use of Power Glide Transmission may be imposed). THE 2012 MISSISSIPPI THUNDER SPEEDWAY CHAMPIONSHIP AWARDS BANQUET! Friends, Family, Fans, and Fun; those are just a few of the aspects of local racing that continue to make it so popular. But the competition of the sport is always one of the highlights, and those who can best the competition are always rewarded. For the fourth year in a row, the racers, their families, crew members, car owners, sponsors, & speedway staff joined together at Winona's Riverport Inn & Suites to remember the completed racing season and celebrate those who enjoyed a successful 2012 season, at MISSISSIPPI THUNDER SPEEDWAY's 2012 Championship Banquet . . . OPENING NIGHT 'BUMP AND GRIND' AT MISSISSIPPI THUNDER SPEEDWAY! In the shadows of a non-existent spring, racers and race fans alike were chomping at the bit for the 2013 racing season to get underway. Some thought it wasn't possible, some thought it shouldn't be attempted but most wanted it, needed it and simply wouldn't go another weekend without it . . . like an itch which needs to be scratched that simply can't be ignored, this weekend was going to see race cars on a dirt oval - whether 'Mother Nature' cooperated or not. After dumping snow in the area a week previously, 'Mother Nature' teased the racing faithful with sunshine and 70 degree weather Thursday and Friday. So, naturally, the track crew at MISSISSIPPI THUNDER SPEEDWAY took the challenge and put forth the effort to prepare the fast 1/3-mile oval for the Friday night April 26th 2013 season opener. By the time the almost 1000 fans on hand at the Fountain City, WI speedway were headed towards their cars in the parking lot, they'd witnessed a wild season opener . . .